We love receiving our clients’ pictures so thank you to Áine for sending this lovely picture of her daughter Ruby wearing her Nicki Macfarlane lace Mirabelle dress for her First Holy Communion. “The dress was stunning on, and personally I thought it was the most beautiful dress in all her class (not that I’m biased or anything)!” We can quite believe it – doesn’t she looks gorgeous? 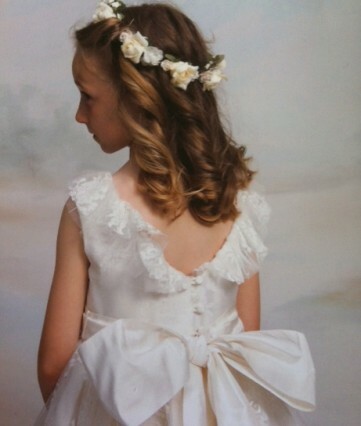 If your daughter is making her First Holy Communion next year, have a look at our Collection here where you will find a wide range of beautful styles in a variety of luxurious fabrics including silk, organza, tulle and lace. This entry was posted in First Holy Communion, Real Weddings. Bookmark the permalink.